So I took another look at many of my sloppy attempts. I found some errors, rather I made some alternate choices that provided what looks like a favorable outcome with respect to my Calendar Theory. The location of Q in K1 is still Nov. 26th, which corresponds to K3. 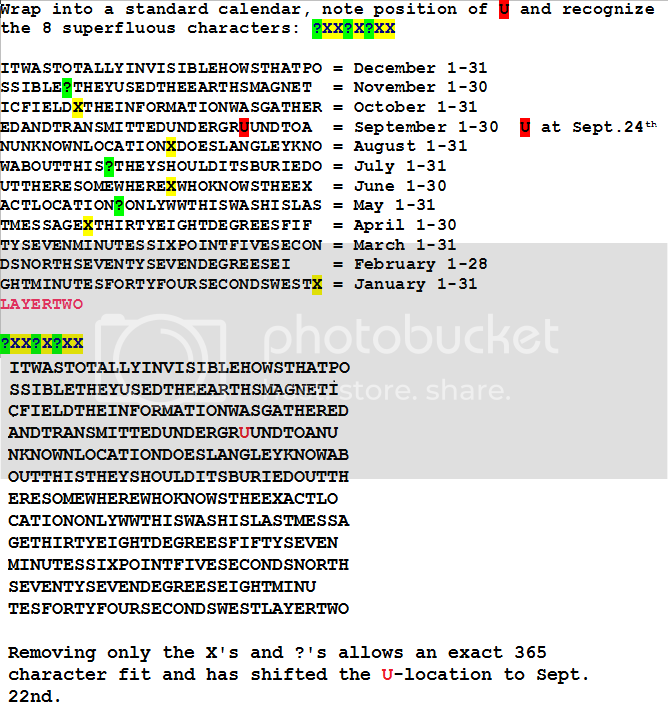 The location of U in K2 isnt Sept. 23rd or 24th as I previously conjectured. According to this new approach, the U fits the date of Sept. 22nd. I Google searched the date and discovered Nathan Hale was the first American to die in the name of Intelligence Gathering on Sept. 22nd, 1776 when he was captured and executed by the British. A statue of him sits on the grounds of the CIA campus. I wonder if K2 hides its date in reference to this statue's location. Maybe the coordinates in K2 have some kind of relationship to the Hale statue. Also, I learned for the first ti.e that a chunk of the Berlin wall was dedicated to a location at the CIA shortly after the Kryptos sculpture was completed. I wonder if the K4 hint has something to do with that. Anyone who knows any details, please share. This is a major observation. For years we have overlooked the other area opposite Kryptos, even though the references to it are all over the sculpture. What is over there? The statue of Nathan Hale! The single most powerful statement of patriotism in the secret service to the United States in our history. It is uncanny how frequently November dates seem to figure into the puzzle. Well done erexere! There is definitely something here, and I'm off to brush up on Hale and his story. Thanks magicicada. I've posted about my attempts to utilize a simple calendar before, but I think most of my links got dead when I tried to "organize" my photobucket files. I'll probably leave most of them dead, since I no longer ascribe to some of those old ideas. Initially the U of "undergrUund" of K2 is in the 4th row down, 24th position (from left to right). After I apply my Calendar Theory, the lines are wrapped to fit the lengths of the months, and based on my convention which starts with December 1-31 followed by November 1-30th and so on, it positions the U at the date location of Sept. 24th but there is the issue of 8 characters left over once the 365 days are filled. I had the idea of removing the X's and the ? 's and we are left with exactly 365 and the U-location shifts left two spaces to reflect the date Sept. 22nd. Keep in mind that this may all be off by 1 if there's anything significant in treating it like a leap year, in which case things seem less certain. Correction: the date 9/22 won't be off if there's a leap year. There's really no indication that this is set up to involve a leap year.